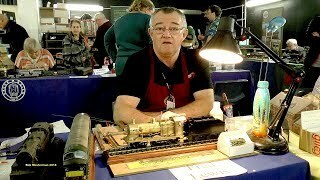 Today, was the 32nd Cardiff Model Railway Exhibition held at Ysgol Gyfun Gymraeg, Glantaf Caerdydd, and features an array of Layouts of all gauges, Sales stands along with several demonstrations from experts in their own field. It was good to see so many friends new and old today, Mrs M and I had a wonderful day. The Exhibition continues again tomorrow the 21/10/2018, so why not come along and have a wonderful time.